When you’re a beginner at songwriting it can be tough. It’s hard to know what process you need to go through to write a good song. And you also feel scared that you’ll make a big mistake somewhere along the way, and your song will be terrible. To compound this, most of the songwriting advice you’ll find posted to the internet or in book stores actually makes it MORE DIFFICULT to write a good song. First though, I’d like to give you a few small pieces of advice that should help get you on the way to writing songs that dazzle and entertain. You might think it’s going to take years to write a good song. While it may take this long to really hone your style and “go deep” into what your capable of, it will not take even close to this to begin creating some really good stuff. Let me give two important points that will help you begin writing great songs right off the bat. And keep in mind that the ideas I’m telling you actually took me YEARS to figure out. Thankfully you can shortcut straight to these "hard earned" pieces of information I’m about to tell you. The first piece of advice I want to give you is this: While you haven’t written a great deal of material, you DO know a lot about music. You know what you like. You know what you don’t like. You’ve probably got a good idea of the type of songs you’d like to write. When you sit down to create something, you must follow your intuition. If you play something or write something and you think it sounds pretty good, then explore this idea further. It’s a common mistake that beginner songwriters make when they think to themselves, “Who am I to know if this is the way a song should be written”. And because of this they stop writing completely! Let me tell you something. The great songwriters DON’T CARE about the way a song should be written. They never have. They simply write, write, write… following their intuition, and great stuff comes out of these sessions. So TRUST that you know when something sounds good. 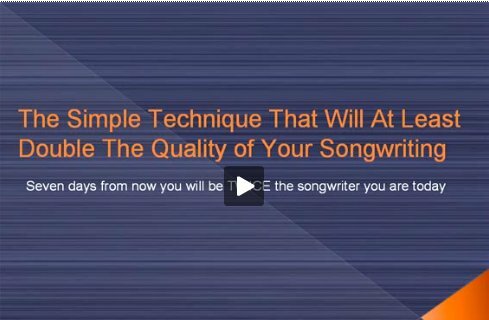 Now, one area that can be tough in beginner songwriting, is knowing how to structure a song. Get RID of this type of thinking! Your brain whether you realize or not is an incredibly powerful creative force. The great songwriters know this and allow it to create freely without “clogging it up” with structures or ideas about the way a song SHOULD be written. So use your intuition. If you need guidance with the way to structure your song, take your favorite track out… play it… and document the way the song’s been structured. Then use this basic framework to create a structure for your song. Another beginner songwriting tip I must mention, because this is one of the best things you can possibly to for your songwriting, is to RECORD your creative sessions. This means that every time you sit down with your instrument to play… have a simple recording device on hand and let it document everything you play (good or bad). If you’d like a step by step procedure that will allow you to create many new and inspiring musical ideas, check out this article (After finishing the current one of course!). Well, I’ve given you enough beginner songwriting ideas to get started, so I’ll wrap this up in a moment. There’s one more thing to address before closing out this beginner songwriting article. And this is VITALLY important. I’m talking about what I mentioned when I began this article… the fact that most songwriting information does nothing but HOLD YOU BACK from writing your best stuff. The thing is: the pathway to unleashing your inner artist… and writing music that you love and that can change peoples lives… is about having arock solid idea of what music you want to create… and then using the insanely powerful brain you have to create these songs. Now this may sound like a mouthful, but bear with me for a moment. They basically treat music as if it’s a mathematical equation and you can piece it together in an analytical fashion. The truth is, inside you is a gifted artist that wants to express itself. And the way to bring this gifted artist out is to tap into your creativity and learn how to follow your intuition. I’ve written a course that examines this creativity process by looking at those musicians who went on to reach “genius” level. By following the step-by-step processes in this course, you too can unleash the natural giftedness from within, and as a result you will write some truly stunning songs. Hundreds of musicians have taken this course, and each day I receive letters telling me that they’re uncovering a songwriter within themselves that they never even knew existed. This course is perfect for beginner songwriting as it means you don’t have to make the mistakes that almost every songwriter makes, and shortcut straight to enjoying life as a creative artist who writes songs that people love! Be sure to test out the ideas I’ve listed in this beginner songwriting tips article... and if you want to discover the master songwriter within you...learn about my course by clicking here. Great advice.I depend on my co-writers.I write lyrics. I actually followed these tips after reading them and wrote my first song within a day and a half. Thanks! HELP ME! i need to write a great song! help!